Thanks to Kevin Martin for this guest blog. Defending youth work in the world of the integrated and targeted service. If youth work is to make a unique contribution to targeted and integrated services for young people, it needs to protect its principle of being a learning intervention. Crime and consequence, welfare and crisis, all interventions that are sadly necessary but learning also has its place. Under the current trend to integrate services, focusing primarily on support rather than education and learning, I am seeing how easily youth work is being lost. What I see emerging is the informal style that is prevalent in youth work being gratefully used to “engage” young people but then switching away from youth work as we know it. The work is looking increasingly like welfare or behaviour modification, changing young person’s circumstances or their awareness of consequence. All good stuff I know, but youth work has something to offer in addition to this. So what is our USP within these support focused services (Unique selling point – keep up!)? We could use youth work a lot more to help young people learn their way out of trouble. Behind every young person in difficulty or trouble that I have worked with, there has been inappropriately met motivational needs. No prizes for guessing that most commonly those needs are physical security; positive attachment or belongingness and the approval of people that make them feel important. These are also straight out of Maslow’s hierarchy of motivational needs, as I am sure you know – Safety, Belonging, Status, it’s all there. One of my trusted colleagues recently told me that there was something cruel about how we take a young person in trouble and seek to stop the behaviours that are actually meeting needs. Even drugs can make you feel safe, we must substitute these things she said. 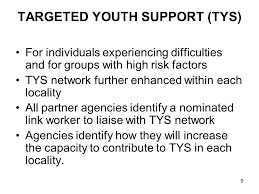 It occurred to me that in youth support services our intervention plans can be full of “aims” or “objectives” that are SMART and include measurable outcomes but pay little attention to motivational drivers and the unconscious “payoff” that young people are seeking. Rather, we need to see assessments highlight why young people do what they do, what needs are being met and what is the payoff for the young person. Subsequent action plans could then take on a greater learning element, helping young people to gain control over their lives by first understanding their behaviours and equipping them to lead good lives under difficult circumstances. This is where youth work can really contribute within integrated, targeted support services. If youth work is not actively encouraged within these services or it is swamped by casework methodology, it could be lost. While youth work has already been compromised in its absorption to other services, my hope is that it isn’t totally reformed, losing that special method of facilitating young people’s growth.